Back in March, we told you about the race to become the first public company in history to be valued at one trillion dollars. Four months ago, Apple's market cap (shares outstanding multiplied by stock price) was $893 billion, or 12% away from the magic number. And while Amazon at the time was 33% away, some analysts predicted that Amazon would hit the mark first based on its steeper trendline and the fact that Apple and Amazon had risen 24% and 87% respectively, year-over-year. 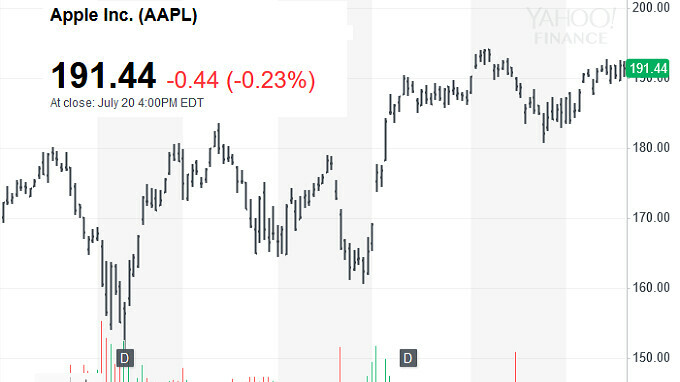 Since that story three and a half months ago, Apple has risen approximately 8.8% to close Friday at $191 and change. With a current market cap of $933.7 billion, Apple is 7.1% away. At $205.04, Apple will be worth one trillion bucks. During the same time period, Amazon has risen 17.1%, nearly twice Apple's rise. With its market cap of $894.6 billion, Amazon is 11.8% away from the trillion dollar mark. When we looked at this race during the first quarter, analysts were calling for Amazon to be the first trillion dollar public company by August with Apple following a week later. Amazon still is outperforming Apple, but the latter is much closer to the mark; Amazon might run out of time. A dark horse in the race is Google parent Alphabet, which has a valuation of $835.6 billion and is 20% away from a trillion dollar market cap. And on the fringe is Microsoft, which just hit an all time high on Friday. However, the software giant is 22% away from the target. Apple is expected to report its fiscal third quarter earnings on July 31st. Amazon will release its next earnings report on July 26th. A good response by investors to either firm's report could go a long way toward having the first trillion dollar public company crowned. Pfft~! We're expected to cheerlead such inequality??? Apple doesn't have a trillions Dollars stashed and neither does Amazon. Why aren’t you asking Samsung or Google for some of their money too? Besides why should any corporate entity give a s**t about “the greater good”? Especially in a capitalist world like the modern one? Right. Why is he only coming after Apple...ohhhh, because he wants likes. Apple is the only greedy entity. Amazon, Google, Samsung, and the lot aren’t greedy at all...only Apple. SMDH. Kiko, you don't have to bark when someone gives their opinion about an article. I respect your stance and your intelligence but you and everyone else on here need to get your "fanboyism" intact. It's not that serious. Side note: Maybe he didnt mention Samsung or Google because this article has NOTHING to do with them, besides a comparison to the top two dogs in this race. He can give his opinions just fine. Doesn’t mean I can’t find his opinions idiotic, though. Humans love to pretend they give a crap about “the greater good” when the fancy suits them, but ask him to give his rent money to an orphanage in need of supplies. Better yet, ask him to give his last dollar to a starving child for food. People love spouting off what such and such could do while they don’t offer anything... how laughably hypocritical. That's just assumption Yes I would help those people And I do support people in need What makes you think I'm pretending Let me see you do something for good of humanity What's this aggressive behaviour towards me Because I talked the truth The way world should be running? What gives you the right to call my opinions idiotic? Because of your ignorance or your ego? You are attacking for nothing The blindness of some here is really laughably hypocritical yessss! LMAO you know fully well how much hate Apple gets just for existing by the fanbois here and you trying to defend one by calling other people fanbois? The article has nothing to do with Google? Bro read it again, Google is mentioned right there! LOL a new trend, fandroids calling out other people and acting like they respect opinions LMAO, the entire concept of the fandroid is one who wants to desperately prove they are superior just because they use a different mobile OS by disrespecting people who prefer iOS. Hahaha, pure Gold. Why don't you share your house with the society - let some bums sleep in your bed - or with the government - let them enrich some uranium in your sink? Apple does make donations, but it likely pales in comparison to what the other big companies contribute. You got owned and served cold. At least be man enough to take it. It's beyond abvious you were trying to throw shade at Apple and only Apple because "Fandroid". It really is incredible how thick fandroids are. You make fun of people who spend money, which they earned, the way they want, and just because they prefer IOS, you think you are superior? And yet you lot go about posting some of the dumbest stuff possible, and when you get owned, you try and play the "respect opinions card", LOLOLOL. However funny it may be, It's now gone beyond ironic and just turned into a sad continuous cycle.